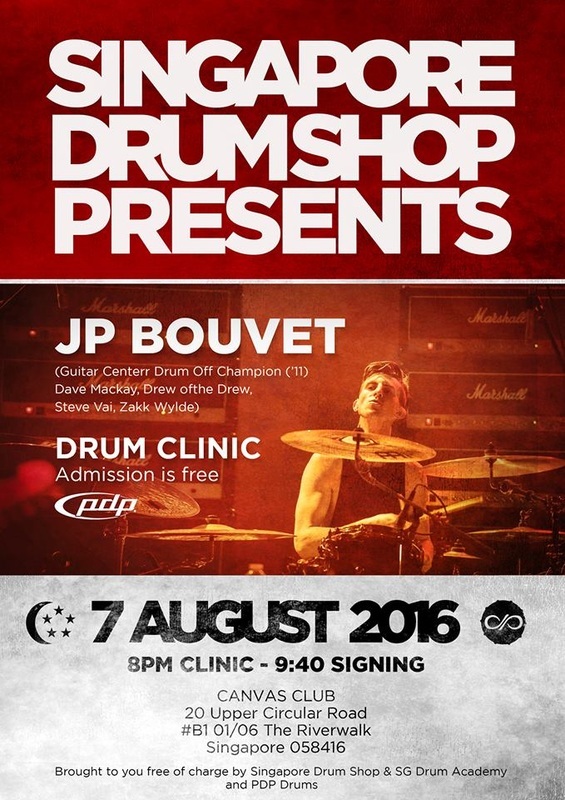 SG Drum Academy, Singapore Drum Shop and PDP Drums are pleased to present the JP Bouvet Drum Clinic. This would be the first ever International Drum Clinic that is opened to the public for FREE and here are some information that might be useful to you. Admission : Admission is FREE and you do not need to register or do any reservations. Clinic : The Clinic will be held at Canvas Club and doors would be open 1/2 hour to 1 hour before admission. Event would be free standing and please come early to "get to the front". Special prizes would be given on the clinic itself. Date : 7 August 2016, 8pm. Lessons : JP's lessons has all been taken up and they will be held on the 7th of August in SG Drum Academy itself. Signings : For Signings, you're welcome to purchase a DW T Shirt from us or you could get JP to sign on products that he endorse, E.g. PDP Drums, DW Drums, Meinl Cymbals, Vic Firth Drum Sticks, Remo Drumheads etc. Disclaimer : We reserve the right to forfeit entry for any improper and rowdy behaviour before or during the event.